The secret of getting ahead is getting started. The tenth national summit of SIOM, Tattv-2015 was one such step in marching the goal. Hotel express Inn, Nashik had seen speakers check in the previous day, students buzzing here and there to receive the guests, managing the stage and lot more. Students were active along with the moon sky and also few more stayed to welcome sun for the next day. The students were arranged in the hall after a fruit drink. The function started with welcoming the guests and prominent delegates on to the seats. The day began after lighting of lamp by the dignitaries and director, Dr.Vandana Sonwaney, SIOM and the faculty in charge, Ms.Yashomandira kharde, TATTV. It was followed by a brief introduction of the theme for the day ‘Disruptive Innovations in Transforming Business’ by the Director, Dr. Vanadana Sonawane. The first among the speakers to address the gathering was Mr. Mohan satyaranjan (senior director, Juniper networks) who had an interesting sharing on how does the cloud computing, social media are creating disruptive innovations in market and thus transforming business. Mr. Mohan Satyaranjan is currently the Senior Director, Juniper Networks. He was the first speaker of the day. He set the stage by talking about the disruptive innovations in different fields. He cited the examples of 4G network, smartphones, high-tech health care facility, GPS and 3G enabled smart sensors and analytics. He narrated how 4G network has taken the speed of internet to an altogether new level, smartphones have become an integral part of human life, high-tech health care facilities have brought a new dimension to the services offered in health sector and how analytics has enabled predicting human behavior. He further told about renewable energy and innovations involved in our day to day life. He concluded his speech by describing that all technologies are combinations of already existing technologies and this combination brings disruption. The next among the prominent intellectuals was Mr.Paritosh Sharma (Head, Channel partnerships, PayUPayments pvt.ltd. 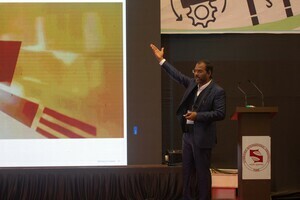 ).He swept the crowd with his excellent oratory skills on the topic “Capitalizing disruptive innovation in expanding business”. He had a magnificent presence on the stage that kept the students riveted to the stage. He embarked upon the key roles played by relationships and networking in order to achieve goals. He instructed to follow three vital steps religiously to develop an innovative mindset – 1. Write down three different unusual or peculiar everyday things from the news we have read or heard about.2. Write down the keywords 3. At the end of every week map those words and try to find out an interesting pattern out of it. Then he spoke about building adaptability by coming out of our comfort zone deliberately or by taking up atleast one new project every 3 months and doing it end to end or by travel consciously (which helps in building up relationships). He also discussed about the 3 kinds of people we must network with –innovators, Opportunity explorers and Master sellers. This will help us in developing our ideas and lead us towards innovation. To conclude with, he advised the audience to apply their theoretical knowledge into practicality in an efficient manner. After a short tea break, which had given the opportunity for students to interact with the guests, the session started with Mr.Sanjay Radhakrishnan (Senior Director, CTS) on the topic “Mindset that leads to disruptive innovation”. He began with a small play of getting the gathering to choose people and standing equidistance from them as they move. He had reiterated, indirectly, the theory of communication and teamwork at the same time. He had begun delivery starting with a quote “What you can do-do, what you cannot-teach “.He said that any problem has to be approached through “why “before “how “. He made it a strong case that any bounded mind would definitely result innovation or as he called it “Aha moment “. He reaffirmed this statement through example of “mini idly challenge” in which people were asked to build a long tower using idlies, spaghetti sticks and accessories. He said that the kids whose imagination knew no boundaries had constructed a longer tower than any other graduate. He played a video through which he conveyed that people orientation is always required and we have to be in other people shoes, in order to get people oriented. Next, he talked about the stages of mindset (Funnel) in the process of innovation: the mystery stage where all the data are random & exploratory research is required, the pattern emergence and finally the uniform output. He also emphasized that knowledge is actually a byproduct of intellect and intuition which forms the basis for any strong innovation. He concluded by stating that not only celebrating success, but also embracing the fear of failure would be required in all. Next was the Panel discussion on the topic “Role of leadership in disruptive innovation: How to be catalyst for organizational innovation”. The panel members were Mr.Ramakrishnan (VP (O)-smart cube) and Mr.Sandeep Kumar (Associate director SC-Johnson & Johnson) and Mr.Suresh Ramani (Head –business development, TVS logistics). Mr.Suresh Ramani played the role of Moderator for the other two members .The members developed insights on the topic with a 360 degree view on the topic, sharing their valuable insights to the audience. Mr. Ramani started the discussion on how the leaders should work while implementing disruptive innovation in the firms. This was followed by Mr.Ramakrishnan who put forth his views on disruptive innovations through an example set by Mark Zukerberg. He also shared the views of disruptive innovation and implementing it in small scale companies or startups. He quoted “Start-ups are like Open Canvas wherein we can create any thing by implementing ideas” .He added notes on incremental innovations that were very small as compared to the disruptions, but added great value and suggested that the leaders should stress on those types. Mr. Kumar talked about carrying out disruptive innovations in large scale and well established firms like J&J where the innovations were campaign driven. Both the members stated that leader should not create a constrained and over-stressed environment where employees work under consistent pressure. In that case, innovation can take place only with a very slow pace. Mr. Ramani steered the discussion by asking the views of the other members whether disruptive innovation is purposive or accidental. Both the speakers after conceptualizing landed on the opinion that disruptive innovation was ‘not accidental’ and was driven by an idea and was purposive. The discussion took a turn towards segregating the industries into manufacturing and service based and their R&D departments which stated that the product- based companies have a strong R&D department which is used for implementing disruptive innovations. After a hefty and delicious meal, the afternoon session began with Mr.Sunil banthiya (Executive director-operations, 3M) on “Innovations in 3M”. He took everyone through a core professional presentation regarding the new technologies that had happened in 3M.He showed the grinding wheel innovation which is being used in manufacturing industries. He explained about the triangular grain structure that had been implemented in 3M grinding wheel and how it had reduced the time in re-sharpening of the grinding wheel. It had almost reduced the cycle time for any grinding operation thus increasing productivity. He also gave a brief description about flat fold disposable respirator with exhalation valve. This particularly played a very important role in the safety aspects of workers. He explained the unique design which ensured not only safety, but comfort too. Next, he discussed on Advanced polarizing films. An on-glass reflective polarizer films, laminated to the rear absorbing polarizer. It is a Color neutral optical film. These are installed on mobile phones and are useful when you read texts in sunlight. These are equivalent of the yellow/red lights that we see on the road, based on the principle of reflecting light. He explained this product, how it reflects the light after capturing it and thus enables the lighting of road. This was also based on micro-structured materials. The next product which he discussed was the “Command clear”. It was a transparent adhesive that were stuck on the back of plastic hooks which, in turn, are stuck on walls for hanging. He thus, gave examples to drive his thoughts on innovation that “connecting the dots” between various fields of application is the first and basic requirement on the way of innovation. He also stressed that the research is the process of transforming money into knowledge and he concluded the topic of innovation through his proven examples. The next session was by Mr. Manoj Kumar (VP-Global head for HR analytics, HSBC). He talked on proactive adaptations required by industries for disruptive innovations. The next session saw our most youngest entrepreneur Mr.Advitiya Sharma(Co founder,Housing.com The next gen- leader who was enthusiastic , joined the stage to give a power packed delivery on how did housing.com emerged. As Newton saw the apple falling, Mr.Advitiya suffered when he had to look a house for Rent. The difficulties of real estate world made him and his friends of what they are now. He shared the experiences that led one thing to another and finally the birth of housing.com. He said about how he integrated his resources to make whooping revenue sheet in just a month. He talked on how the concepts emerged at morning 3.30 a.m and how they started planning from 3.35 a.m. He also talked on how a guy from US had booked a new house through housing.com one hour after he posted it on website. He also said the success they had made within two years. He did not forget to thank his investors. On answering questions on whether hosuing.com would see a global front, he smartly answered on how he would like to conquer India before moving outside. He said developed countries like US; China had almost saturated on the real estate front, but India will a potential player in future. A naughty question on what does IIT teach such that many IIT-ians go into some other field and create disruptions, he answered calmly answered that it is just the method of thinking that IIT imparts. Throughout, he had delivered an energetic lecture and created an all round disruption in the keynote addressing which left students enthusiastic and energetic even in the post lunch scenario. He set an example on how even a small thought, which satisfies our requirements along with a clear strategy, would position you as a successful entrepreneur. The students acquainted themselves by having selfie session with him. The session was then taken by Ms Ritu David, ( Founding CEO at Ritu David Consulting). She spoke about the importance of imbibing disruptive innovations right from the root level. She shared, one of the practice which was undertaken by her to achieve disruptive innovations, which was of forming of Red Teams. These Red Teams were a group of resources allocated for working on disruptive innovations dedicatedly. This practice, was helped in giving an altogether new scope for innovations, and a new recognition for such disruptions. She also highlighted the vital importance of communication of your innovative ideas to others. This involves the art of communicating the idea by considering the listener’s perspective. The last session was taken up by Dhrubil Sangvi is the Co-Founder at LogiNext. He was the last speaker of the Day.His topic was “Role of automation in creating disruptive innovation”. He talked about start-ups. He briefed about the processes that should be followed before starting a start up. These processes must include an innovative idea, feasibiliy study and a proper value statement tha can beat the competitors. His session was more interactive where he wanted to know about the students aspirations. He wanted to know, who all want to start start ups and what are their ideas behind the start up. He briefly discussed about some of the start ups and the innovations in them.He concluded his speech with a strong focus on automation, creation of disruptive innovation and sustainability. On the whole, the event set a strong benchmark on how a national event is done. The event not only enabled transfer of knowledge, but also gave a live example of successful teamwork. The students of SIOM could not ask for more than TATTV to have a live case study on Operations Management. The event saw pioneers of industry and promised a fresh set of crowd , getting chiseled and groomed, waiting to disrupt the future markets. Dear World,” Wait for surprises, here we come”.